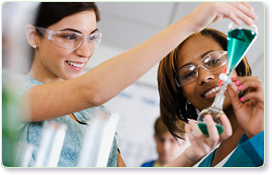 FabFems are women from a broad range of professions in science, technology, engineering and mathematics (STEM). They are passionate, collaborative, and work to make the world a better place. Many girls have similar interests but aren't connected to adults who exemplify the STEM career pathway. This is where you come in. Create a FabFems profile to expand girls' career options, dispel stereotypes and spark their interests - just by being you. Sign up today to be a role model! How you choose to be a role model is completely up to you! When creating your profile, you choose whether you want to just have an online profile and no contact all the way to offering job shadowing opportunities. It's up to you! If you choose, students, parents, and educators can contact you securely through the site with opportunities to act as a role model. From school career days to email mentorship, how you choose to be a role model is up to you! Looking for someone to ask questions about a field you're interested in? Hoping to get some female STEM role models to join a career day at a school? The FabFems role model database is the perfect place to find women in STEM who are passionate about acting as role models. Search the database by zip code, field of interest, and more! Once you've found a role model that fits what you're looking for, if the role model is willing to be contacted, you'll see a green contact button below their profile picture.